What’s The History Of Catholics In Columbus? A political scribe’s pen can pack more wallop in Columbus than a politician, especially when the writer is an outnumbered Democrat in the conservative Ohio House of Representatives. Mike Curtin knew what he was getting into in 2012, when he traded in his reporter’s hat for a seat on Capitol Square. The homegrown journalist who rose from reporter to president of Dispatch Printing Co., owner of the Columbus Dispatch, won election nearly four years ago to the 17th District that covers much of the Hilltop, Valleyview and other down-and-out west side neighborhoods. Even as a lawmaker, Curtin kept penning political tomes, including recently updating the Ohio Politics Almanac with a third edition. But legislating is a time-consuming job, especially in one of the poorest districts in Ohio. Curtin, who turns 65 this summer, won’t run for re-election this year so that he can spend more time traveling with his wife and watching his grandkids grow. Curtin started in 1973 as a reporter at the Dispatch and focused mostly on politics. He rose through the ranks to become the daily newspaper’s editor and eventually vice chairman in 2005. Along the way, Curtin became one of the state’s most respected journalists. He retired in 2007 but consulted with the Wolfe family-owned newspaper until he began his short legislative career. “I was the Jim Siegel of this place in the early to mid ’80s,” Curtin said, referencing the Dispatch’s current Statehouse reporter. As a state legislator, Curtin noted just how stark partisanship can be, which he blames in part on gerrymandering. But that’s an obvious analysis for many who follow politics. More nuanced might be his observation about law enforcement’s diminished status at Capitol Square. In the 1980s and ’90s, police-affiliated groups could flex considerable political muscle when they were united on issues like firearms legislation, Curtin said. Words of caution from the Fraternal Order of Police, Buckeye State Sheriff’s Association, Ohio Prosecuting Attorneys Association and the Ohio Association of Chiefs of Police carried clout when they urged tighter regulations on guns. Indeed, a May 8 column by political writer Thomas Suddes identified utilities, banks, insurers, nursing home operators and oil and gas drillers – but not the police – as those with the most influence at the Statehouse. Curtin thinks expanding term limits would help some of what ails policy making. Since 2000, Ohio lawmakers in both chambers have had their stays limited to eight years, though they can spend more time on Capitol Square through a loophole that allows them to switch between the Senate and House. Curtin would like to see the maximum extended to 12 years, preserving institutional knowledge on complex issues such as energy and the environment that can take up to five years to master. “In my view we need the Ron Amstutzs, we need the Jack Ceras. We need the people who have the long view and understand how we got to where we are,” he said of the experienced Republican and Democratic representatives. That’s a part of why Curtin wants to get back into explanatory journalism – taking a public policy issue and reaching back in time to explain how it came to be. He did that in the 1990s during the DeRolph v. State of Ohio school funding debate that ended in the state Supreme Court’s ruling Ohio’s funding mechanism was unconstitutional. More recently, changing the composition of the Columbus City Council to 13 members from seven and moving to district representation are proposals ripe for the kind of analysis Curtin hopes to provide. Through out its history the City of Columbus has enjoyed a strong stable economy, but it has never had the type of rapid economic expansion experienced by some of its neighbors. In the Great Lakes Region Cleveland, Pittsburgh, and Cincinnati grew to become economic powerhouses and reached impressive population numbers 1800s. Columbus’ economy has grown steadily and strong over the course of its two hundred and two years of existence. The economy of Columbus has grown steadily in that it never had the booms or busts of its neighbors and has become so strong that it has long been labeled ”recession proof”1. The country has experienced a great many periods of economic turmoil since Columbus’ founding in 1812 but Columbus has weathered them all. Currently, the city boasts a number of large corporate headquarters including American Electric Power, Nationwide Insurance, The L Brands (formerly the Limited). Columbus also is home to numerous world class research institutions such as: the Ohio State University, Chemical Abstracts, Ross Laboratories, Abbott Laboratories, and the Battelle Memorial Institute. The city boasts the headquarters national or major a facility for a number of banks including: Fifth Third, Huntington, and J.P. Morgan Chase2. There are a number of factors that have, throughout its history, contributed to the economic success of Columbus. These factors are primarily the city’s location, and its diversified economic portfolio. cities; some of them were built next to lakes such as Chicago and Cleveland, others along rivers like Pittsburgh and Cincinnati. Over the course of their history Cleveland, Pittsburgh and Cincinnati and Columbus have drawn many advantages from their location. Cleveland, Pittsburgh and Cincinnati’s proximity to lakes and rivers would allow the cities to become bustling boomtowns by the middle of the nineteenth century. Columbus grew modestly during much of the nineteenth century, but never having the booms that its neighbors would. From the beginning Columbus’ neighbors had advantages it did not. Being on the shore of Lake Erie, Cleveland has easy access to trade with other Great Lakes ports3. Pittsburgh being further east was closer to the bustling East Coast and the confluence of the rivers meant that it was an important stop on trade routes west.4. Further west Cincinnati was the gateway to the western frontier as the Ohio River was one of the main routes for penetrating the country’s interior5. Columbus has no lake, and its rivers, the Scioto and Olentangy, were barely navigable. Cleveland, Pittsburgh, and Cincinnati’s economic history was strongly shaped by their waterways, Columbus’ story, on the other hand, is quite different and it was forced to forge its own different path. center of the state, however, this it would soon turn into a major factor in deciding the economic future of the city. During the city’s first twenty years of existence from 1812 and 1832 Columbus’ economy was mainly focused on fulfilling its role as the state capital. Being the state capital would mean that the city would always have government as a major driver in the cities economy. In addition to being a seat of government, Columbus also had to meet the needs of the visiting legislators11. Legislators needed housing, and food and supplies; this would also be the start of the tradition of a service industry that remains strong today12. The role that government has played in Columbus’ economy has grown as the city ages 13. Not only is the city the capital of the state and the seat of Franklin County, but it is also a city that stretches for over 200 square miles and across three counties. Today Columbus has city, state, county, and federal offices, which make government the single largest employers in the city. According to the City of Columbus government accounts for eighteen percent of the jobs in the city or 158000 of the 904000 jobs in the city14. High government employment has also given the city an industry to lean on in times of economic turmoil15. opened the city to trade with the heavily populated east to the ever-growing western frontier. The canal opened the city to trade ranging from Canada to Mississippi 18, 19. Truly Columbus was now a crossroads. For the beginning, its location on the trade routes had a dramatic impact on Columbus economy, travel the city was now easy, and many people and goods were passing through the city going east, west, north and south. For the first time it was simple for trade between all of Ohio’s main cities, goods from Cleveland could be sent down the canal through Columbus to end up in Cincinnati. At the head of the canal Cleveland’s markets gained a boost as goods flowed to the city to make their way south, Cincinnati’s position as the gateway to the west was enhanced as goods to go west were now easily obtained. In between Cleveland and Cincinnati was Columbus which began to realize its valuable location. One could not get to one town from the other without traveling through Columbus. This meant that goods in Columbus had the unique position of being able to go in either direction. Not only did Columbus get a boost from all of the individuals now moving to the city, but it also opened up the market to Columbus’ goods. Shortly after the Canal reached the city prices for Columbus’ farm goods doubled and demand for wood from the city skyrocketed20. the 1830s it was an even higher percentage of the population. Being that closes to half the population means that goods shipped from Columbus can quickly reach much of the nation’s population, this meant that Columbus was a perfect location for storage, distribution and wholesale. By the turn of the 20th Columbus had its own warehouse district located northeast of Downtown. The importance of wholesale can be demonstrated by the number of hardware wholesalers have had locations in Columbus, including Timken, Buckeye Roller Bearings, Berry Brothers Bolt Works, among others22, 23. Shortly after World War I, again, due to the city’s location, the federal government greatly increased their presence in the Columbus economy, as they located a Defense Construction Supply Center (DCSC) here in the city24. Not only did the placement of DCSC in Columbus boast its economy, but also demonstrated the value of the city’s location. As the 20th century moved forward newer distribution centers would be placed in the city including J.C. Penny, Sears (the largest single roof warehouse building in the world) and Eddie Bauer (its only distribution center not located at its headquarters)25. Distribution is still alive today in Columbus, the city even boasts one of the only cargo only airports in the world, Rickenbacker International Airport 26. Distribution and wholesale currently makes up 4% of the Columbus economic profile or 37300 jobs27. was placed at a crossroads, which opened up many new economic opportunities for the city. The nation had grown larger since the National Road and Erie Canal entered Columbus and the railroads linked the city with a much greater trade system than ever before. Trains also linked Columbus to the bountiful natural resources that Ohio has to offer. The first trains connected Columbus to the rich coalfields in southeastern Ohio to the Great Lakes and access to the ore being mined in Minnesota31. With trains ores mined in Minnesota could be efficiently brought to Columbus and even Cincinnati, via the Great Lakes and a stop in Cleveland. The 1850s through the 1870s saw new train routes entering the city, routes that would cross through from Pennsylvania in the east on the way to the major cities of Chicago and St. Louis in the west. The Pittsburgh, Cincinnati, Chicago and St. Louis Railroad line (the Panhandle route) of the Pennsylvania Railroad, became on of the largest and busiest routes between, as its name implies, Pittsburgh, Cincinnati, Chicago, and St. Louis, though it traveled through Columbus. Between north and south, east and west Columbus was the hub 32, 33.
which was located near coalfields, or Cleveland, which had access to ores around the Great Lakes, and Cincinnati which had access to metals from the blast furnaces east on the Ohio River Columbus is located hundreds of miles from where the metals and coal were being mined making it inconvenient, and impracticable, to ship raw materials to the city 36, 37, 38. Much of the refining was done closer to the sources, meaning that processing the ores and coal would be the driving factor in economies close to the sources, but not in Columbus. This is part of the reason that heavy industry became the main driving force behind Cleveland and Pittsburgh, and Cincinnati, but not Columbus. During the major expansion of railroads from the 1850s through the 1880s Cleveland and Pittsburgh experienced periods of extremely rapid growth. The proximity to metals and speed of railroad shipping allowed Cleveland to go from a city about the size of Columbus at just over seventeen thousand residents to a population of a hundred and sixty thousand39. The lure of Pittsburgh’s heavy industry allowed that city to grow from over eighty six thousand residents to over five hundred and thirty thousand40. Columbus was, however, at the center of many trade routes and its factories obtained much of the refined ores and coal, from cities like Cleveland and Pittsburgh, which were in turn used to create finished products41. Even though Columbus would not have the boom that its regional neighbors did from heavy industry it still could benefit from it. Columbus during this time was able to grow to a city of over fifty thousand residents42. mining equipment and horse drawn buggies in the world 43, 44. Until World War I Columbus manufacturing continued relatively unchanged. The Great Depression struck Columbus’ manufacturing industry heavily, and it would not be until World War II when Columbus manufacturing took off again. Even though heavy industry ground to almost a halt during the Depression, Columbus managed to make it through better than Cleveland or Pittsburgh. Columbus’ economy depended much less on heavy manufacturing than its neighbors meaning that its economy could be supported by the other industries45. Decisions made by the Federal Government during World War II helped to revitalize Columbus economy. During the war the Federal Government decided to place the Curtiss Wright airplane plant in the Columbus (once again due to the city’s centralized location), this would spur new manufacturing again in the city after the war46. By the end of World War II, in part due to the work of Columbus Mayor James Rhodes Westinghouse, GM Motors would take up residence in Columbus. 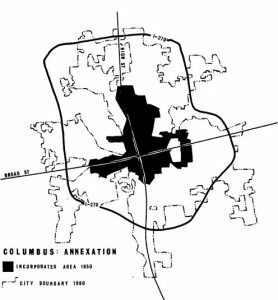 By the 1950s Western Electric and North American Aviation (replacing Curtiss Wright) would have homes in Columbus 47, 48, Columbus is not located in an area that would lend itself to primarily focusing on heavy industry. Because of this and the fact that manufacturing entered Columbus’ economic portfolio comparatively late it never dominated the city. Rather manufacturing, would simply add another pillar on which Columbus’ economic health would rest. In contrast to Columbus cities such as Cleveland, Pittsburgh and Cincinnati would experience huge jobs losses during the 1970s and 1980s. In part due to increased competition from overseas as a result of an increasing amount of globalization, Cleveland, Pittsburgh, and Cincinnati all faced crisis in their manufacturing sectors 49, 50, 51. . Today manufacturing makes up seven percent of the jobs in Columbus, with sixty three thousand workers 52. The confluence of train routes at Columbus also opened other avenues for economic growth for the city. Trade and industry brought new money and people to the city of Columbus. To cope with the influx of wealth into the city Columbus has developed a strong financial industry. It was in the 1866s that Huntington Bank started53. Many major banks call Columbus home, or have a major facility here. Huntington and Fifth Third each have their own skyscraper downtown, and J.P. Morgan Chase has a large processing building. Insurance entered the Columbus market heavily in the 1920s when the Ohio Farm Bureau Federation incorporated the insurance Farm Bureau Mutual Automobile Insurance Company. In the 1950s the Company change its name to Nationwide Insurance. Today Nationwide is a Fortune 100 company that employs over eleven thousand and controls multiply blocks downtown by their corporate headquarters54, 55. Many other insurance companies call Columbus home including the Grange. Finance is a particularly strong pillar in Columbus’ economic portfolio as the city has a high percentage of financial jobs as compared to the rest of the country 56. Today the financial industry makes up seven percent of Columbus jobs with over sixty eight thousand employees57. Xerox produced vast sums of money that were used to transform the small facility into the massive research facility that it is today 59,60. Today Battelle employs over two thousand employees and is magnet for researchers coming to Columbus from all over the world61. Columbus is also home to many other world class research institutions. Ross Laboratories, maker of formulas and nutritional supplements had got its start in 1903. Today Ross Laboratories in now a part of Abbott Nutrition and is a leading researcher into diet and nutrition62. Chemical Abstracts Services (part of the American Chemical Society) started in 1907 and is now is the largest compiler of chemical formulas63. Demonstrating how important research is to Columbus’ economy is the fact that Battelle, Abbott Nutrition, and Chemical Abstracts are the 19th, 21st and 34th largest employers in the city, respectively64. Closely related to research is the technology field. In 2008 Columbus was rated by Forbes as the number one Up and Coming Tech City in the nation65. The area in and around Columbus contains two thousand science and technology firms and institutions meaning that the city is a large magnet for those seeking positions in the technology field 66.. Indicative of Columbus tech potential is the Online Computer Library Center (OCLC). Founded in 1967 OCLC sought to bring technology to libraries, using computers for cataloging. Today OCLC’s CONTENTdm is used by many major museums, and its WorldCat connects libraries across the globe67. Companies such as OCLC are anchors for Columbus’ technology field and will help it advance in the future. continues to provide a large financial impact on the City of Columbus. Though the various governments combined provide a larger number of jobs, the Ohio State University is the largest employer in Columbus as a single entity, with a total just short of thirty thousand full time positions68. Between tuition, spending by students, visitors, and athletic game attendees, it is estimated that the Ohio State University has an impact of 2.4 billion dollars to the Columbus economy69. Rounding out Columbus economic portfolio is its retail industry. Though Columbus has always had a certain amount of retail, Alfred Lee lists in depth the stores available to the early residents; it was not until the 1950s and 1960s that retail joined the ranks of the major industries70. Columbus itself experienced tremendous growth in area during the 1950s and 60s as Mayor Sensenbrenner and the City Council pursued a policy of aggressive annexation. As the city grew so to did demand for new commercial outlets. Prior to this time retail was mainly focused Downtown with the department store Lazarus as the anchor71. With annexation came a rise in new retail and service jobs in the city, particularly on the city’s peripheries, a trend that continues today72. It was during this time that Columbus’ retail future was made, not only was there was a shift to near suburban shopping , but also many of the present retail moguls got their start during this period. Leslie Wexner, whose Limited Brands would become a driving forces in Columbus’ commercial field by the end of the 20th century opened his first store in 1963 73. Today eleven percent of Columbus’ jobs are in the retail field with ninety six thousand employees 74. Leading into the 21st century Columbus boasts an economy based on government, research, education, finance, and retail. The diverse portfolio of economic drivers has helped Columbus maintain a stable economic course through out its history. When one pillar of the economy is weak the others remain to stabilize the city75. At the beginnings of the 21st century Columbus’ economy has be a bright spot in the Midwest. While its neighbors Cleveland, Pittsburgh, and Cincinnati all suffered massive declines during the 20th century Columbus has remained constantly growing. Consistently Columbus now outperforms its region and the United States in many metrics measuring economic health76. With a sound economy built on many different pillars Columbus’ economic story illustrates how to weather economic storms. Columbus’ resilience in the face of economic troubles is evidenced in the fact that as of January 2013 it was the only city in the Midwest to regain the jobs lost during the Great Recession. 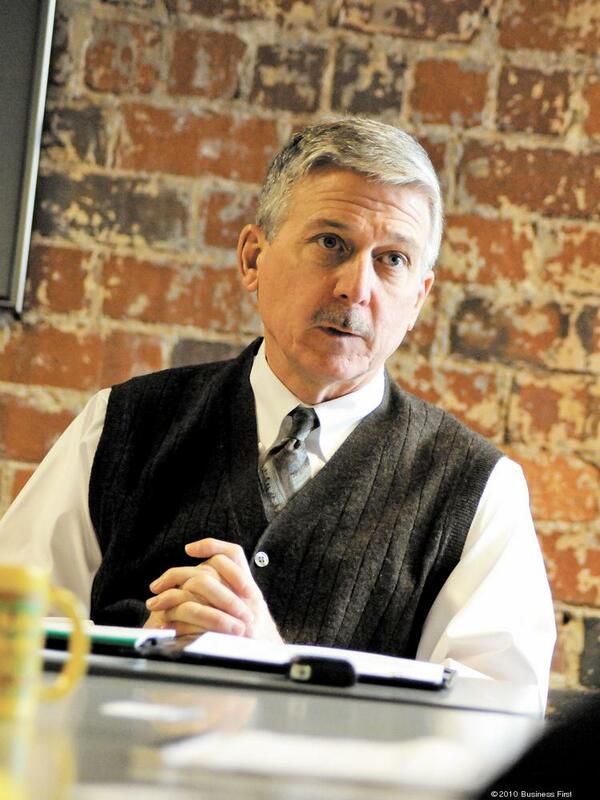 The situation for Columbus’ neighbors has been improving since the latest economic downturn. Lately Columbus’s neighbors have all been diversifying their economic portfolios. The Great Lakes region has been experiencing a rapid growth in the number knowledge based jobs versus, manufacturing jobs, jobs that do well when the manufacturing sector is suffering78. In recent years, particularly following the Great Recession, Cleveland, Pittsburgh and Pittsburgh have begun leaving their heavy manufacturing past behind and have been focused on a wider range of industries. Great strides have been made in all three cities in the areas of business services, finance, and healthcare79, 80, 81. The future will see a region of cities with numerous strong avenues of economic development, cities that in many ways mirror the City of Columbus. 31.) Lee, Alfred (1892) Vol. II. 54.) Nationwide Insurance (2013) Nationwide’s Corporate History. 59.) Battelle Memorial Institute How to Change the World Columbus, Ohio: Battelle Memorial Institute.